Wheeler Wildlife Refuge, headquartered in Decatur, Alabama, is on the Eastern migration route for the Whooping Crane, seen here with a group of Sandhill Cranes. Photo courtesy of George Lee. An Important Bird and Biodiversity Area (IBA) is an area identified as being important for the conservation of bird populations. IBA was developed and sites are identified by BirdLife International, a global partnership of conservation organizations focusing on conserving bird habitats and associated biodiversity. 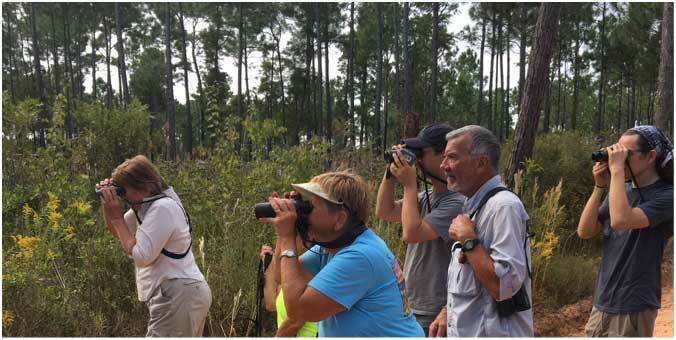 The National Audubon Society administers the IBA program in the United States. Currently there are over 12,000 IBAs worldwide. Alabama has 24 IBAs that are considered important on a state level and 6 that are ranked on a global level. Wheeler Wildlife Refuge in north Alabama (Limestone, Madison and Morgan counties) is designated as an IBA of global importance. Nearby state-level IBAs include Bankhead National Forest (Franklin, Lawrence and Winston counties), and the Walls of Jericho/ Skyline Wildlife Management Area (Jackson county). 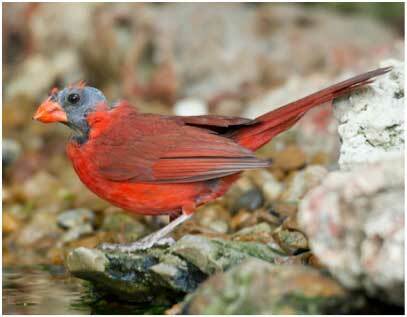 Have you ever seen a Northern Cardinal with a bald head? If so, you may wonder what cruel trick Nature is playing on this once lovely bird. Every year in late summer my resident pair of Northern Cardinals drop all of their head feathers at once. They look like small vultures or possibly, lizard heads grafted on to a bird’s body. Is this normal?! Apparently, though not extremely common, it is normal for some Northern Cardinals and Blue Jays to lose all or nearly all of their head feathers at once, according to Cornell University’s Project Feeder Watch. The good news – their feathers grow back within a few weeks. All birds must replace their feathers at least once a year as the old ones wear down. For most birds, molting (shedding old feathers to make way for new ones) happens gradually – they lose a few feathers at a time rather than dropping them all at once. While it may not matter as much for body feathers, most birds will shed flight feathers only as new feathers replace the old. Birds do need to fly, after all. At least, most birds need to fly. Oddly enough, waterfowl are an exception. Able to obtain food and shelter on the water, ducks, geese and other waterfowl may molt all of their flight feathers at once after breeding and before migration in the fall. Molting is energy intensive for birds so they will need to eat plenty of food at this time of year. Northern Cardinals are year-round residents but migratory species will also need to pack on some body fat in preparation for long migratory flights. In addition to providing backyard feeders, we can help birds meet their energy needs by planting beautiful bird-friendly native fruit trees and shrubs. Elderberry, holly or winterberry, northern spicebush, and flowering dogwood are just a few examples. To learn more about bird-friendly native plants, check out Audubon’s Native Plant FAQ’s or How to Create a Bird-Friendly Yard.